(June 28, 2018) -- To advance the success of UTSA students, faculty and staff while providing a cost savings measure to the university, the UTSA Office of Information Technology will launch Adobe Creative Cloud university-wide, beginning this fall. With the launch, UTSA students, faculty and staff will have access to Adobe Pro, Photoshop, InDesign, Illustrator and more. The Adobe software will be available in all UTSA classrooms and student laboratories and on UTSA computing assets used by faculty and staff. “The implementation of the Adobe software creative suite of applications delivers the latest and most creative software tools to the university community, said Ben Garcia, UTSA OIT director of customer service and support. “Leveraging the use of these software tools will foster greater knowledge creation and provide the opportunity for greater student success outcomes at UTSA." To prepare and strategize for the fall launch of Adobe Create Cloud, Tobares, Garcia and Vanessa Kenon, assistant vice provost for IT, attended the Adobe Creative Campus 2018 Collaboration Conference at the University of Utah earlier this month. The conference provided renewed awareness on the importance of collaborating with faculty to improve digital literacy on campus and to transform teaching and business operations that support the student success journey. During the conference, several institutions including the University of North Carolina, Chapel Hill, Clemson University, Boston University, Penn State and California State University, Fullerton shared their experiences with implementing Adobe Create Campus Cloud. 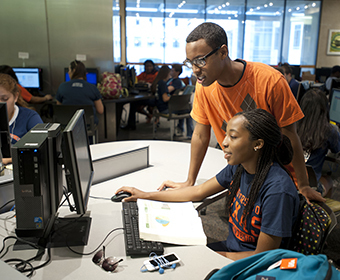 Learn more about OIT student technology resources at UTSA.